Happy Release Day for the authorized sequel to Bram Stoker’s Dracula! 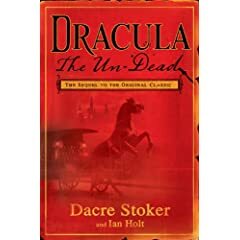 Dracula: The Un-Dead is co-written by Ian Holt and Bram’s great-grandnephew Dacre Stoker. Just in time for October 13th, Entertainment Weekly lists the 13 Greatest Pop-Culture Vampires. Delve deep into legend surrounding Dracula and Transylvania at this Romanian Tourism site. Look into the mind of author Bram Stoker. Finally…a list of the best non-sparkly vampire novels of all time. Hungry for more? Try a slice of cake. Although my recipe for Fangtastic Peanut Butter Cake is bloodless, it’s still sweet and salty delight. In large bowl, stir flour, salt, sugar, and baking soda. In small bowl, whisk eggs and buttermilk. Melt together peanut butter, water, and butter. Bring to a rapid boil. Pour hot mixture over dry ingredients. Mix. Add buttermilk and egg mixture. Pour into greased jellyroll pan (or 9X13 pan). Make Frosting: Bring 1 stick real butter, 1/2 cup peanut butter, and 6 tablespoons buttermilk to a rapid boil. Add 2 tsp. vanilla. Mix in 3 to 3 2/3 cups powdered sugar. Mix well. Frost cake while still warm. Looks positively delightful. I’ll have to check it out. I promise you’ll love it. It’s very dense and moist. If you like PB, you’ll love it. Love all the Dracula connections 🙂 I hadn’t realized they had authorized a sequel. That’s pretty unusual. I hope it holds up to the standard!